5. What else should I make sure to learn? I've setup Domino on Windows hundreds of times. (I've even set up Notes on OS/2 back in the day.) All of my recent experience, however, is with Windows. I have no experience with setting up Domino on Linux. The concept of mapping drives, rights, and administration are foreign to me. If I was comfortable with this stuff I would follow some of the blog posts I've found on setting up Domino in Linux. Frankly, when I see things like Daniel Nashad's script I realize I need some context and I think a conversation with an expert would be helpful. SERVER.ID, NAMES.nsf, and Domino Installer for Linux. To save time, I can even have the Linux OS (Ubuntu) operational in advance. We can use GoToMeeting to share screen and keyboard/mouse. Anyone interested in helping me out? 1. How will IBM Verse make people more productive? 2. Can we help make people more productive with Verse? For all I can see, both of these questions are still unclear, but Nathan's just posted some great thoughts about them. Keep in mind that this is a marketing video, so the real Verse may or may not perform as shown. So far, it appears to be a web-based front end to IBM Connections, Domino-based mail, and other IBM collaboration tools. It is unclear, at present, how many of these tools will be required to experience the features shown in the video. It looks like Verse is big on sharing and collaboration, but less so on personal productivity -- that is, actually getting work done. My research and work with thousands of people has shown me that, no matter the collaboration, knowledge work is inherently personal. In this area, Verse has less to offer. Verse does add a form of the "Waiting For" from David Allen's Getting Things Done, which is a positive step. I'm looking forward to seeing their next video and, of course, to seeing the real product in action when it ships. P.S. Here are Hogne Pettersen's thoughts on Verse as "promiseware" competing with Microsoft. My first paid consulting job convinced me that technology would solve all our problems. Over 30 years ago, I was writing flight-planning programs with a 1-kilobyte* programmable calculator, and it was incredible: calculations that took hours by hand were done in a few minutes. What I didn't see then was the whole picture. Technology is (and always has been) only part of the equation. My client and I had to put our knowledge together: his knowledge of the math needed for flight-planning, and my knowledge of how to write that into a program. 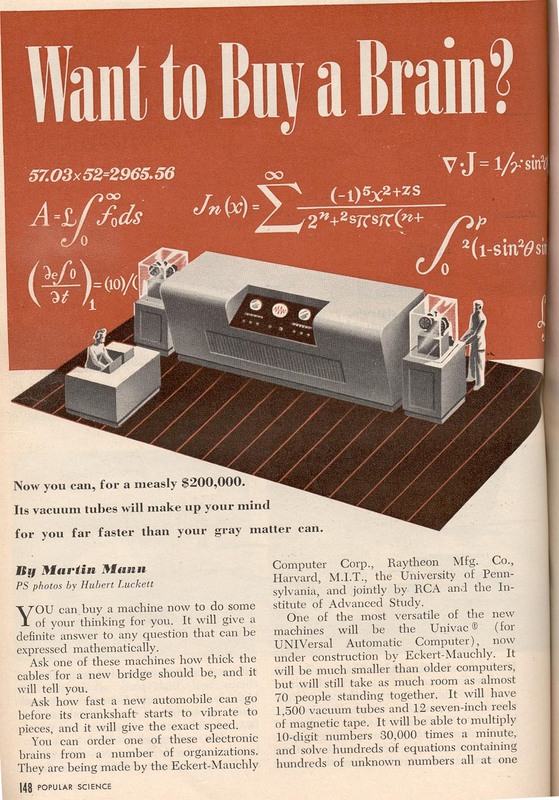 "Its vacuum tubes will make up your mind for you far faster than your gray matter can." Somehow I'm reminded of modern ads claiming that technology can decide what's important to you. During my graduate research on how people work. I saw that even people with the best technology could work very ineffectively. At the same time, some people could use outdated equipment – even as simple as pen and paper – and create great value for their organization. Obviously, technology alone didn't make people better workers. It became clear that technology is useless if people don't know how to work with it – and more importantly, use it to work together. Methodology: the habits, rules, and practices that people follow to get work done. In other words, how people work. Without all three, our operation wouldn't have worked and I would've been out of a job. I was delighted to come across a very insightful article that Mark Mortensen of INSEAD recently wrote for the Harvard Business Review: "Technology Alone Won't Solve Our Collaboration Problems." He emphasizes "a simple truth: it’s not what technology you’ve got, but how you use it" and includes three specific examples of how to work more effectively with today's technology. I'm glad to find someone who recognizes "it’s less important which technology you choose and more important that you align it with how people do work." Mortensen acknowledges the importance of method and knowledge as well as technology. See here for his article. The interaction of knowledge, methodology, and technology is critical to any organization's success and the value of any individual's work. This is what I've brought to my consulting clients over my decades in the field, and I've clearly seen the results: it works. To share your thoughts on this topic, connect with me on social media (below). When you're ready discuss how I can help you and your organization manage the balance of KMT, click "Contact" in the upper-right. I'd love to chat! *For the younger crowd: 1 kilobyte is about 1/16,000,000 of the memory of a standard iPhone 6. A few days ago, I was talking to my Robotics students about the posts made in our Facebook group. I didn't want to come across as the old guy bashing social media, but I told them I was surprised at how little discussion was actually taking place online. Students would post, but usually others would only respond by "liking." If my students were only posting cat videos, I wouldn't have a problem with this, but most of the posts were meant to start discussion or get feedback. For these kinds of posts, "like" doesn't mean anything. Before Facebook and Twitter, if you wanted to engage with somebody's post, the only way (on nearly all platforms) was to make a comment. Writing and posting a comment takes at least a little thought and effort. I'm not saying that "liking" is bad and everyone should stop it. What I am saying is this: think about what your "like" means. In this case, "like" simply means "yes." In this case, "like" doesn't mean much of anything, except maybe "I approve of this idea, but don't want to contribute anything to it." After that talk with my students, I noticed that they commented more and "liked" less. IBM Connections is now positioned as the platform upon which the rest of the IBM social and collaboration suites rest. IBM Sametime is now IBM Connections Chat and Meetings. So, we have IBM Connections Mail and the IBM Domino Application Platform. I have a 20+ year history with the Notes name so I will miss the name but not what it can do for me, I'm all for the branding consolidation if it leads to better unity and vision across the IBM portfolio. There was no mention of the Notes client or the Domino server other than a brief mention that IBM will be hosting Domino Apps in the cloud. Microsoft is sure to pronounce what they have been trying to get their customers to believe for years, that Notes is dead. Notes is most certainly not dead, but it is evolving and I will be watching to see what roadmap IBM presents for the future. Meanwhile, IBM showed off a new vision for the mail client - their Mail Next vision. While new and shiny, it looks like it will be quite distracting to actually use when you just want to get work done. There no way to actually use this product (if it is yet a product) and it will likely be some time before we can try it first hand so time will tell on that front. 3 Things I've Learned about being Productive while Telecommuting. Telecommuter. Remote Worker. Digital Nomad. Road Warrior. These are but a few of the names used to describe people who don't regularly see their co-workers face to face. I'm one of them. Perhaps you are, too. The names can imply different things. A road warrior is someone who takes frequent business trips while a remote worker is (usually) someone who works from home. Measuring how many people telecommute is difficult. Regardless, telecommuting comes with it's own set of opportunities and challenges. Let me share some things I've learned. An app closer to the LotusLive tipping point? We use GoToMeeting and GoToWebinars extensively to manage our company events. I have been following with interest the announcements coming from IBM about LotusLive and as a long-time Yellowbody I really want to use LotusLive. My concern has been that many of our events, like the recent world wide Notes & GTD event with David Allen, have close to 1000 participants and I don't know how LotusLive would handle an event of that size. It's not about $ as both services are very competitively priced -- it's about stability and features and I really don't have much time or justification to investigate either. No point venturing into this area when what we have works so well for us and there's no visible ROI to switching. So, I continue to sit back, waiting for someone to blog about hosting a large meeting on LotusLive to convince me to switch. Today, IBM just added another reason to consider. They just announced an app for the iPhone that will allow mobile users to participate in a LotusLive meeting. I'm not an iPhone user yet so that's not terribly exciting to me yet but something Darren mentioned does have my interest - apparently IBM has a mobile app for the BlackBerry in the works, too. As a BB user, that would be cool. A tipping point? Probably not. But value add? Yes. I've never attended a webinar on a mobile device so I can't speak to how effective this is or isn't, but it has potential as a mobile productivity solution. I don't know how many meetings I would attend this way, but It would be great to manage my meetings and view details from anywhere. You can learn more about the IBM app for LotusLive and iPhone here. xPages Wiki on OpenNTF... Wow! I have a topic that I want to put out to the Notes community to discuss. I could simply blog about it and ask people to comment. The challenge is I end up with a long list of comments without threads. I could direct people to a forum where discussions would be threaded but at the end I would have to summarize all of the conversations into one document - too much work. The Web 2.0 thing to do would be to post the document to the web and invite people to modify the document itself. I thought a Wiki might work well for this purpose and so I headed over to the OpenNTF site to download the new xPages Wiki, managed by Steve Castledine and Niklas Heidloff . In less than 5 minutes I had downloaded the Wiki, read through the quick start guide and set up my first xPages Wiki. That's it. Less than 5 minutes. Wow! Word wrapping appears to change places from time to time. Some times a line will wrap in the middle; other times near the end. I do a lot of off-line work. I wonder what will happen if I edit pages and replicate back to the Domino server when others have made changes. I may want to limit myself to off-line reading and reference. All in all, for a 20-minute investment, including a test Wiki page and this blog post, I'm impressed! As Ed Brill announced this morning, Lotus has released a new Lotus Solutions Catalog. eProductivity is a featured app in the catalog, and I was really pleased to see eProductivity up on the big screen during a session called, "BDD101: Lotus Messaging and Collaborating drives Better Business Outcomes", presented by Kevin Cavanaugh and Mike Masterson. Be sure to visit the catalog at http://catalog.lotus.com. Hat tip to Mike and his team for doing a great job with the catalog. In this clip from my interview with David, he relates his background as a long-time Notes user and advocate. He finds combining the power of Lotus Notes and eProductivity to be a natural fit and he's very pleased with the results. I have a few more clips that I hope to post soon. I had the opportunity to spend time with David Allen this weekend to talk about Getting Things Done, Lotus Notes, Cloud Computing, and extreme productivity. David allowed me to interview him on some questions and record it so I could share it with you. Here's the first video. I'll try to post a few new clips each day. If We Dropped Notes and Went for SharePoint, Would That Fix Everything? Michael Sampson has been focused on the effective use of collaboration technology since the mid-1990s. I met him at a 1997 EMA conference, where we co-presented on the future of unified messaging -- and we've been friends and business colleagues since. For several years, I've encouraged Michael to write a book on Lotus Notes for collaboration. I even contacted IBM press to see what's involved - a lot. Michael shared that in the absence of significant market awareness of Lotus Notes he did not think a book around Notes made as much business sense as a book around SharePoint. (Michael's been a long time Lotus Notes user and advocate; we continue to use Notes to collaborate.) For the past few years, Michael has been focused on the use of SharePoint for collaboration. Michael's just published his second book on collaboration; this one's called "SharePoint Roadmap for Collaboration." I had an opportunity to be a part of the review process and I think the book is excellent. If the examples were changed, it could easily be called "Lotus Notes Roadmap for Collaboration." What's important are the principles, which are true regardless of platform. I've asked Michael to write a guest post for the Notes on Productivity blog, because having gone through the copy of his second book, the themes are just as relevant for Notes people as for SharePoint people. I highly recommend that you buy a copy of Michael's second book, both to learn about SharePoint and to read about the principles of effective collaboration that Michael addresses. As an adjunct professor at The Master's College, I teach MGT-430 Technology for Business Decision making for each organizational management cohort. (I'm also and Alum of TMC and the OM program). Computer Services has begun upgrading TMC's six year old student email system to a new email service hosted by Microsoft called Outlook Live. Testing of the new system is under way and the migration of students and alumni to Outlook Live is anticipated during Spring of 2010. Impressive - notice the large 10GB mailbox, multiple POP/SPOP, and Active-Sync support, too. Students will LOVE that. Now, consider the expectations that young people entering the workforce will have for the tools that they will use at work. Do you know any employers that allow 10GB Mail, access from a variety of mail clients, including mobile devices, and integration with external mail providers? Today's productivity tip has nothing to do with Lotus Notes and everything to do with an elegant collaboration application. EtherPad is a real-time collaborative text editor. It lets multiple work on the same text simultaneously. I recently participated in a knowledge management Peer Assist and we used EtherPad to collect our ideas in real time on a single page. The sky itself may not be falling, but some of your data may be falling out of the clouds. As I read about various cloud-computing initiatives shutting down (and probably for good reason) I can't help be wonder about the people that faithfully parked their information in the cloud, for free or fee, so that it would be available anywhere and at any time. This year, we've seen several businesses shut down, providing little notice for users to backup their information. And, when they do, it's often in a format that cannot be easily migrated elsewhere. Others learned about the perils of DRM protected music when you vendor decides to shut down its licensing server. (This subject has been covered widely so I won't go into detail.) I'm sorry, telling a user that they can protect their investment be burning every song they have purchased to CD and then ripping them into another music app is unacceptable. They should honor the service or unlock the purchase. But I digress. Back to the cloud. Oh yes, the sky is falling. I don't know about you but, unless I have real-time replicas of everything, I am already very cautious when it comes to storing my data where I cannot see or control it. I have almost 20 years of data in Lotus Notes. I can access my oldest information as easily as I can access the newest. I do have hosted Domino servers but the data I store there is simply a replica. If the provider goes belly up, I still have full control over all of my data locally. I have less of a concern about the social networking sites where the value of much of the information diminishes over time. So, if I lost Twitter, I would not grieve as something else would emerge to take its place. If I lost LinkedIn, I would hurt a little more, but since my public profile is mostly static I can make a copy from time to time. On the other hand, my life working data - my email, my applications, etc., that's another story. Are you confident that your cloud-computing vendor will be around next year? What about your data? How does this affect your decision to move your data into the cloud? While I understand that there's always a gap between the marketing/press release and the reality and I do not know how big that gap is, I am very excited about the Lotus Foundations offering from IBM. The idea of a drop-in-place server that is remotely managed and self-healing is very interesting. It appears to provide the benefits of SAAS with the security and capability of an on-site solution. If you are running foundations, I'd like to hear of your experience. Update: Gregg Eldred just posted this summary of a Foundations article in The Register. Is SharePoint an effective tool for team collaboration? What can we learn from SharePoint as a collaboration tool? In early February, my colleague and industry analyst, Michael Sampson, sent me copies of his two most recent independent research papers that evaluate SharePoint 2007 as a team collaboration tool. I've known Michael Sampson for the past 11 years, as a professional (we met as speakers at an Electronic Messaging Association EMA Conference). In that time, we have become good friends and, even though we differ in our choice of computing platforms, I still have great respect for his work as an independent researcher and analyst. Michael funds his own research and enjoys the freedom to publish his observations and recommendations without having to water them down due to vendor pressure. I think he's a balanced researcher and an excellent communicator. How does SharePoint measure up as a 7-Pillars team collaboration tool? Michael Sampson and I are busy working on the session planning for our upcoming eProductivity Conference. There remains much to complete, but we are supported by a wonderful group of advisors and great technology. I thought I wold take a quick break during lunch to share how we are using Lotus Notes to collaborate synchronously and asynchronously, across the Pacific. This allows us to work together on content, synchronously and asynchronously - even though we are on opposite sides of the Pacific! As we work on content I update a field in the document to change the document state to any of the above. In the background, as I work, these changes are replicated from my Windows laptop or Tablet PC in California to my primary server in Arizona and from there to Michael's Tablet PC or Mac, in New Zealand. It does not matter who's on-line, when, or what platform we choose to use. (Michael and I have a few quiet preferences about PC or Mac) After replication, each of us will see the documents that require our attention, edit and comment and flag them for review and the cycle continues back across the Pacific. Think of it as digital volleyball. Thanks to Lotus Notes replication, we are able to simultaneously manage hundreds of documents in various stages of completion. Add to this, our use of MindManager and other productivity tools and we've got a neat system for information sharing and collaboration across the miles. For me, a powerful aspect of this approach is not only the ability to compress work into a small amount of time, but the ability to break our focus down to very next actions. Between my family, graduate studies, client work, eProductivity Beta, and preparation for this conference, about the best I can do is keep my head down and focus on the simple next actions, the things I can do in one setting. I'm grateful to have Michael's expertise as the eProductivity conference organizer. I can't imagine doing this without his help and without a cool set of tools to make distributed work easy. Lunch is over. Time to get back to work. My colleague, Michael Sampson, has just published the first part of his two-part white paper: Collaboration Software Clients: Email, IM, Presence, RSS & Collaborative Workspaces Should Be Integrated for Business Communication. In his paper, Michael returns to "first principles," as he discusses the types of software-facilitated interactions the information professional deals with on a day-to-day basis. I think Michael does a great job of identifying the key requirements for functional collaboration while proposing how things, in his view, "should" work. I've known Michael for many years and he does amazing work. We first collaborated together in 1997 on a presentation for the Electronic Messaging Association, (EMA), on the topic of "Smart Messaging." At that time, Michael was a strategist for Telecom, New Zealand, and I was CTO of Peloria Technology Corp. I moderated a presentation with Michael and another colleague, Eva Wylie, of Unisys Corporation. Together, the three of us spoke about the present and future needs of collaboration in the area of multimedia messaging. It's been fun these past years to see some of our predictions come to pass. There is obviously still a long way to go, and Michael seeks to address these issues. A neat thing to know about Michael, is that he writes these reports and his daily Shared Spaces blog as a way of staying sharp in his field. No doubt, he generates new business from some companies, who read his work and choose to engage him for strategic consulting, but the driver, as he once explained to me, is the public accountability that his blog and these reports create for him. Michael's already published that he will post part II of his paper in September, so he's already got a stake in the ground. (You will want to add it to your "Waiting For List"). I'm sure he won't disappoint us. I've got a busy week ahead; I'll probably have more to say about Michael's report soon. For now, I encourage you to download it and have a look.